The Natural Stone Competence Center in Wuerzburg was founded in 2007 by the German Natural Stone Association (DNV) to provide information about the implementation of the Construction Products Regulation (CPR), the harmonised standards for natural stone product and the Assessment and Verification of Constancy of Performance (AVCP) system of products established by Commission acts, to which the concerned products needs to be submitted before the manufacturer is entitle to draw up the Declaration of Performance (DoP) and to affix the CE marking. Also the application of natural stone in buildings, the testing of natural stone and problems when using the natural stones for buildings and pavement are discussed. 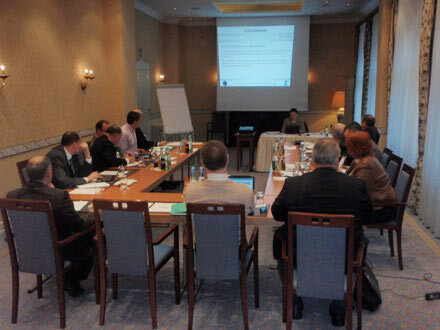 In one or two meetings each year in Wuerzburg, experts in the natural stone business from whole Europe exchange their experience. This is the framework chosen for the celebration of the 2. SUSTAMINING Workshop (Wednesday 25th November, LGA Wuerzburg), oriented to inform about the results obtained in the study quarries by means of the different geophysical techniques and exchange of ideas in the field of selective and sustainable exploitation of ornamental stones based on demand. The workshop has served as a platform to debate and discuss between the main stakeholders (quarry owners, SME Associations, Universities) the main advantages and disadvantages of the different geophysical techniques applied in the SUSTAMINING Project (georadar, 3D-ERT, Reflection, refraction and MASW), utility and applicability in the study quarries, as well as to show the geological models obtained in each of the study quarries and the development and application of geostatistical methods to estimate natural stone resources. Finally, the main results of the SUSTAMINING project were discussed: definition of quality indexes, waste reduction and increase in quarry safety conditions. The afternoon was dedicated to natural stones and other natural stone-related technical issues of information and the exchange of views on the revision of various EN standards, the European Directive for building materials and the Environmental Product Declaration (EPD). Marmomacc is the leading global event for the natural stone industry and represents the entire supply chain, from raw material to semifinished and finished products, from processing machinery and technologies to applications of stone in architecture and design. As a fundamental international meeting for all sectors in this field and an influential platform where business meets professional updating, Marmomacc is the ideal venue in terms of quality and completeness of exhibits combined with the most advanced know-how in the natural stone processing operations. The fair which took place in Verona from 28th September to 3rd October 2015 celebrating this year its 50th anniversary. 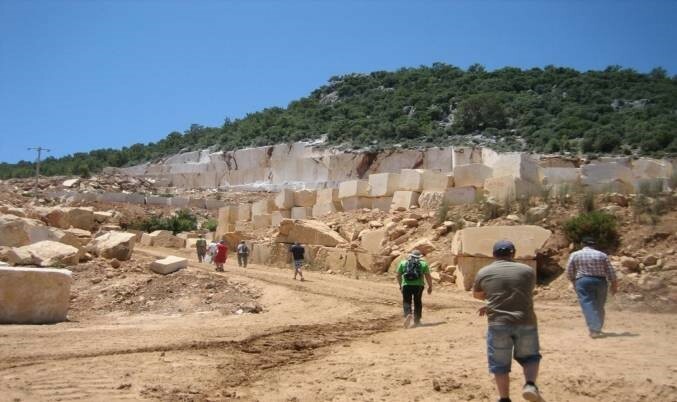 The I SUSTAMINING Training Course (1-2 October) was developed both at the Marmomacc Fair as well as at the Ghirardi case study quarry, with the aim to train to quarry owners, geologists, mining engineers, Natural Stone Associations representatives, students and general public about the possibilities of making a selective and sustainable exploitation of natural stone quarries by means of the different geophysical techniques and the interpretation of the data for obtaining the geological models and the quality indexes. The training course has also served as a platform to debate and discuss between the main stakeholders (quarry owners, SME Associations, Universities) the main advantages and disadvantages of the different geophysical techniques applied in the SUSTAMINING Project (georadar, 3D-ERT, Reflection, refraction and MASW), utility and applicability in a real study case, as well as to show the geological models obtained and the development and application of geostatistical methods to estimate natural stone resources. Finally, the main conclusions about the adavantages and disadvantages of each technique have been discussed. 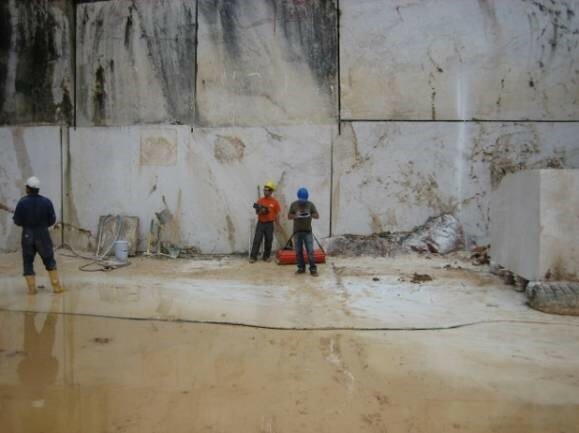 For more information (programme, posters, presentations, photographs and practical videos at the Ghirardi case study quarry) go to the Training Course Verona section at SUSTAMINING´s webpage. Stone+tec is one of the most important international trade fairs for natural stone and stone processing technology with a clear focus on the natural stone sector in Germany, Austria, Switzerland and the neighbouring countries and an extensive spectrum of products in the segments of natural stone, technology and gravestones. With its 446 exhibitors and around 15,000 visitors, Stone+tec 2015 once again lived up to its reputation as the No. 1 industry gathering. The fair, which took place from 13 to 16 May 2015 at the Nuremberg Exhibition Centre, offered the highest caliber of exhibitors and visitors and presented a top-class range of products and a wealth of information about the natural stone, technology, gravestone and accessories segments. This is the framework chosen for the celebration of the I SUSTAMINING Workshop (Saturday 16th May, Kopenhagen room), oriented to inform about the results obtained in the study quarries by means of the different geophysical techniques and exchange of ideas in the field of selective and sustainable exploitation of ornamental stones based on demand. 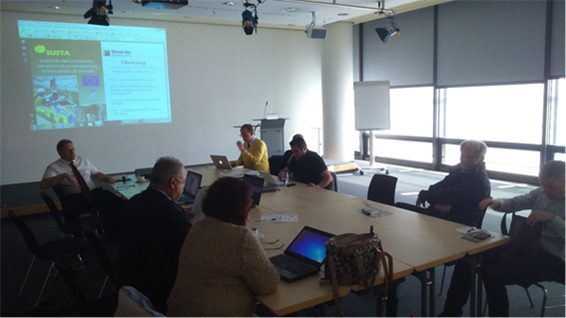 The second SUSTAMINING Workshop will be held in Würzburg, Germany on 24th November. We will inform soon in this webpage. 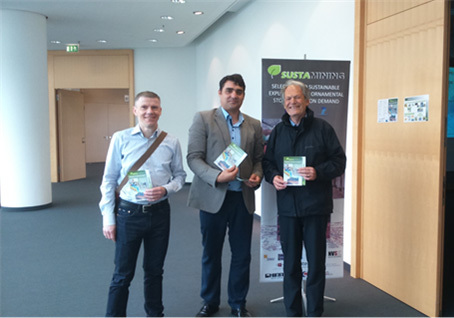 The 5th General Assembly and S/T Meeting of SUSTAMINING was held on 15th May 2015 at Stone+tec fair (Kopenhagen room) in Nuremberg, Germany. 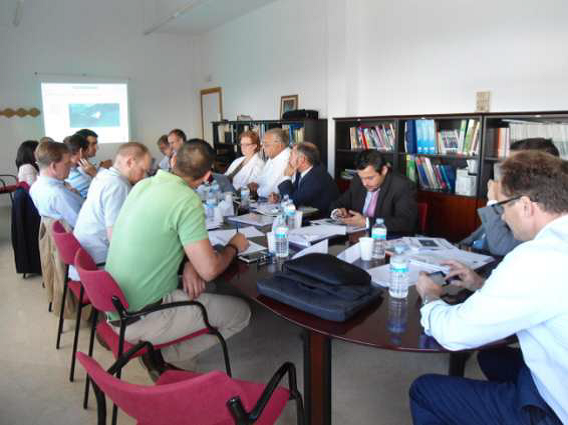 The main objective of this meeting day was to inform and discuss about the project progress since the previous General Assembly meeting, held in Toledo, Spain on 16th December 2014. During this meeting, it has been given a general explanation about the technical development and results achievement of the measurements with 3D-ERT and 3D visualizations, with Reflection, Refraction and MASW and 3D visualizations and the development of geological models of the study areas including the localization of karst areas and weak zones. The development of geostatistics methods for evaluating and optimizing the exploitation of natural resources was introduced by MIRO as the main aim of WP3. The progress of the Innovative Business Models using the Canvas model has been introduced by EUROMINES and discussed by all the consortium. 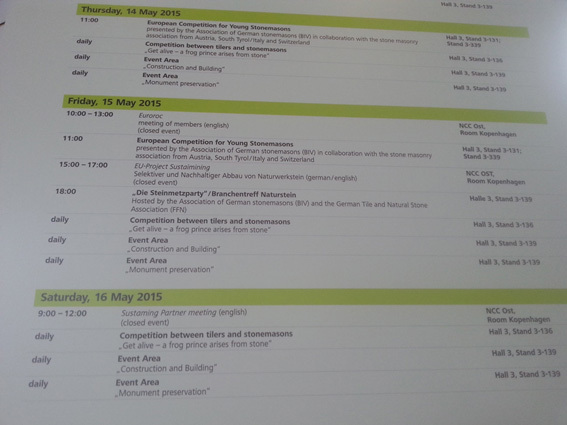 Finally, we have established during this meeting the training strategy development and workshops deployment for 2015. Images of the V SUSTAMINING General Assembly. At the end of the first reporting period FDP, the Spanish Federation of Natural Stone, left out the project. We are very pleased to announce the accession of NVS, the Swiss Natural Stone Federation, to participate in the project, taking the role and responsibilities of FDP in the project from July 2014. 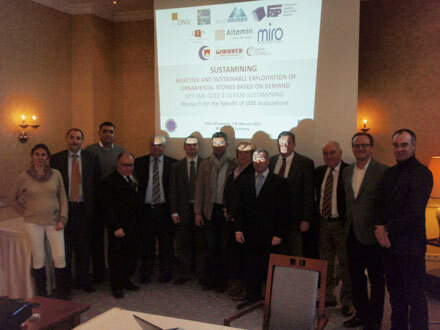 The 4th General Assembly and S/T Meeting of SUSTAMINING were celebrated on 16th December 2014 at AITEMIN-Centro Tecnológico premises in Toledo, Spain. The main objective of this meeting day was to inform and discuss about the project status until Month 15 (March 2014) and its progress since the previous General Assembly meeting, celebrated in Izmir, Turkey, on 27-28th March 2014. 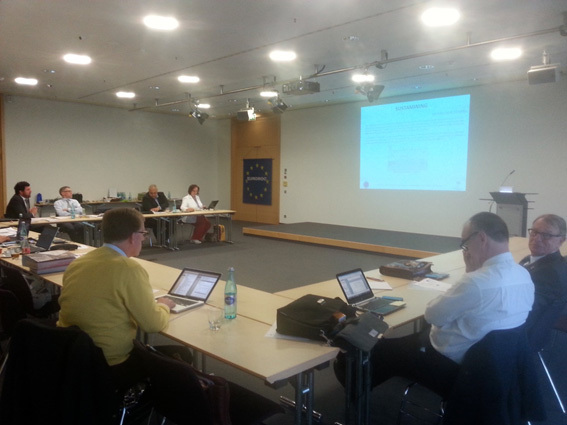 The first reporting period of the project ended at the end of March 2014 (31.03.2014), so in this meeting, we have discussed and explained the assessment report sent by EC concerning to scientific/technical achievements and use of resources for the first reporting period, implementation of the project, use and dissemination of foreground and the calculation of the next payment. At the end of the first reporting period, the beneficiary number 4, FDP the Spanish Federation of Natural Stone, left out the project. 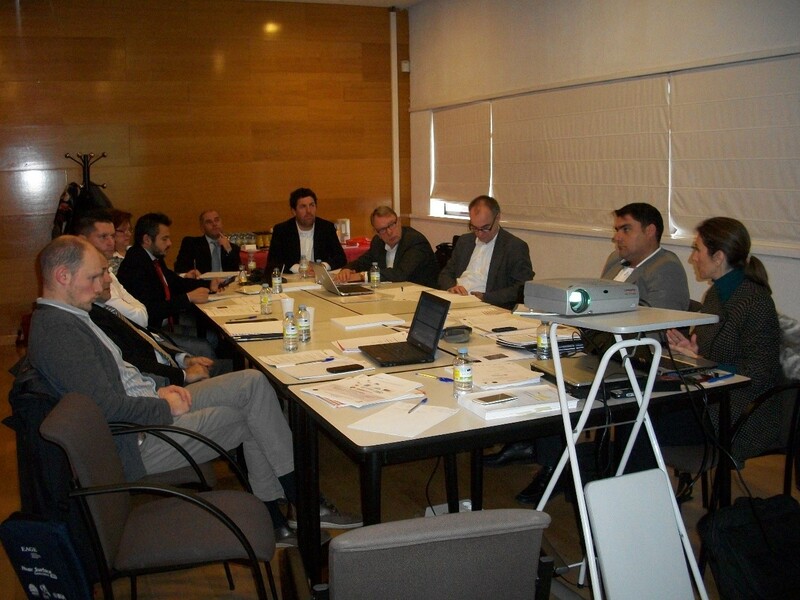 In July 2014, NVS the Swiss Natural Stone Federation, agreed to participate in the project as beneficiary number 11, taking the role and responsibilities of FDP in the project. The process of amendment request for NVS Accession was initiated. The leaving of FDP out of the project has produced some changes in the project, mainly concerned to new dates for reporting some Deliverables and Milestones due to the delay in the execution of the fieldworks in the study quarries. After that, a general explanation about the technical development and results achievement of the tasks and deliverables carried out during this period was made. Each responsible partner explained the status, tasks in progress and delays and risks of the concerned tasks and deliverables for the next reporting period. Images of the General Assembly. 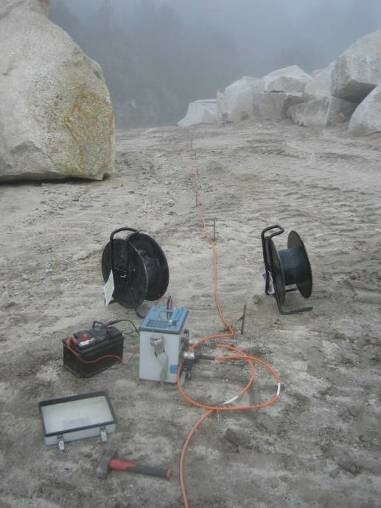 The GPR measurements into Penido Quarry were performed between the 15th and 19th of April 2013. The Penido quarry, geographically, is located into the NW of the Iberian Peninsula, in the south western of the Galicia region, immediately to the North of the Portuguese border. From a geological point of view, the studied zone is a section of the Centre-Iberian Zone, specifically, between the paleogeographic zones IV (Central Galicia - Tras Os Montes) and V (Western Galicia). MATTE, Ph (1968). The quarry is located into the called Ribadavia Batholith, and is formed by granodiorite and granitic rocks intruded during the Variscan orogeny. These rock outcrops show alteration phenomena (arenisation), fracturing and have a characteristic morphology (castellated hills and boulders disjunction). 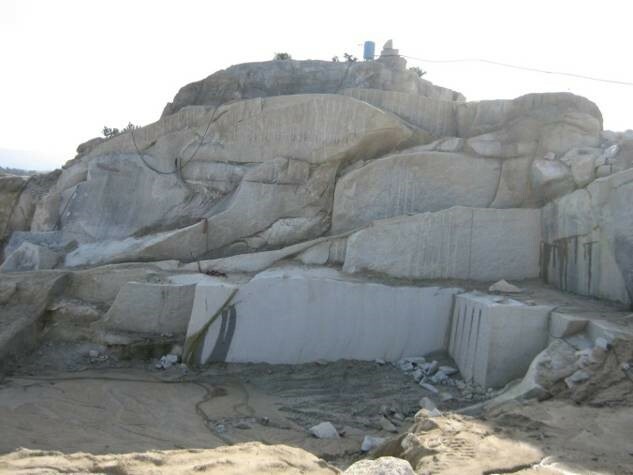 This quarry is an example of a traditional granitic exploitation and could be considerate as representative of the Natural Stone sector that extract granitic rock in large areas of Europe. • Decompression fractures: sub-horizontal, in "onion" layers. • Tectonic fractures: sub-verticals / verticals. Fractures associated to decompression process are also common, there is an "arenisation granite", which has an influence in the shape of quarry. On the surface of the quarry area, the granite usually appears weathered. The main interest in this quarry is to know the tectonic shape (faults, fissures, etc.) of the quarry using GPR. Panorama of the Penido Quarry near Ribadavia, Galicia (Spain). The used GPR exploration methodology has consisted of performing GPR profiles with different frequency antennae, in order to achieve the maximum exploration depth into the quarry's soil (up to 20 - 100 m). Examples of quarrying fronts (left) and not mining areas (right) explored. The Ground Penetrating Radar (GPR) measurements into HITUSA quarry were made between the 17th and 21st of June 2013. This fieldwork is into the WP2 of the project. The HITUSA quarry, geographically, is located in the province of Mugla, Fethiye (Turkey). From geological point of view, the studied zone is located in the Tauro Mountains (limestone and dolomite rocks from Mesozoic). 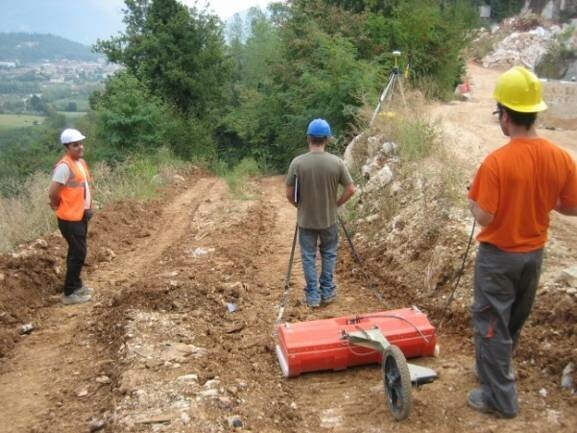 The GPR measurements were made by AITEMIN, CTM and MIRO Teams. 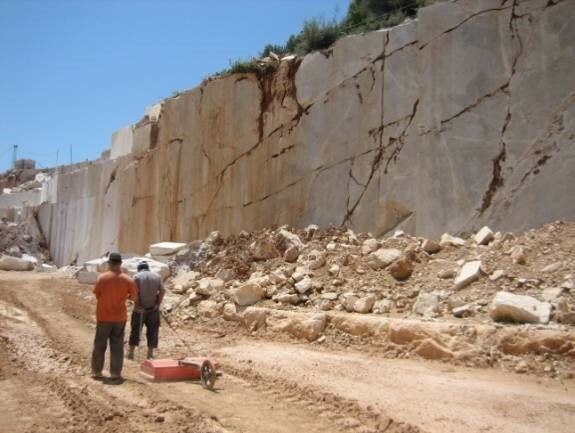 In this quarry a marble material whose marketing name is Emperor Marble is mined. Its petrography classification is a sparitic dolomite (dolosparite). During the geological survey of the quarry, it was observed that in the area of the quarry karts formations (cavities) have been developed, in general along pre-existing fractures and usually filled by clays. This geological context of the quarry made that the main purpose of the GPR survey was the detection of fractures (faults, fissure...) and cavities with karstic origin. These anomalies could be the factors which define the profitability of the quarry and the future mining planification. The used GPR exploration methodology has consisted of performing GPR profiles with different frequency antennas, in order to achieve the maximum exploration depth into the quarry's soil (up to 20 - 100 m). Examples of fronts quarrying (left) and not mined areas (right) explored. 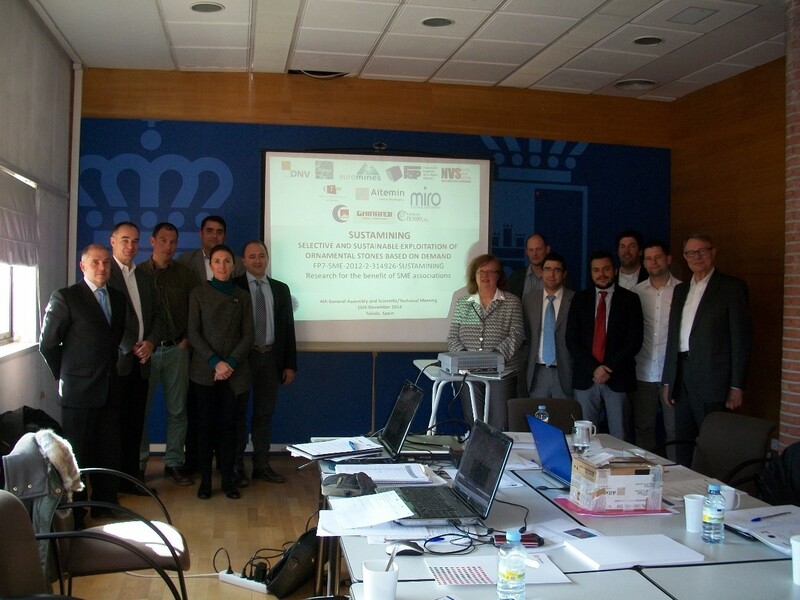 The 2nd General Assembly and S/T Meeting of SUSTAMINING were made between the 4th and 5th of July 2013 into de Marble Technological Centre (CTM) located to Cehegín (Spain). The main objective of this General Assembly day was to present the results of the first six months of the project, its tasks and results, as well as the first deliverables. In addition, the way to address the next six months of the project was agreed and established. Other planned activities were to transmit the expectations from the European Commission and to show the Governance Structure and the Communication Flow for the project. 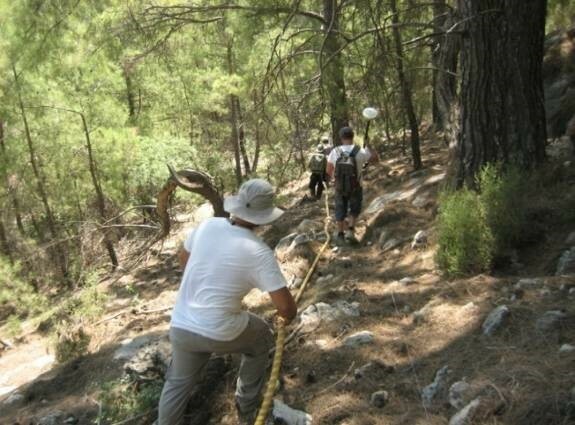 The second day was devoted to fieldwork. It was considered important to organize a visit of all partners and staff, not only technicians but also managerial and administrative positions, to know the state of the industry in the exploitation of natural stone. During this visit, the current process for the extraction of natural stone was shown to all members by San Marino Group technicians. The GPR measurements into the GHIRARDI Quarry were made between the 23rd and 26th of September 2013. This quarry, geographically, is located in the province of Brescia in the region of Lombardy which is in Northern Italy. In the quarry, multicolored limestone breccias, mainly ivory-white, gray and brown, devoid of stratification are mined. The geological period of these breccias are from Early Jurassic (Pliensbachian age) and its marketing name is Breccia Aurora. The petrography classification of this stone is Brecciated Micrite (Folk classification) or Brecciated Mudstone (Dunham classification). Moreover, the rocks of the quarry have been affected by different tectonic phases that have developed numerous fractures. Furthermore, it was observed that karst formations (cavities), in general along pre-existing fractures and usually filled by clays, have developed in the quarry. These geological characteristics of the quarry made that the main purpose of the GPR measurements has consisted in the detection of fractures (faults, fissure) and usual associated cavities (karstic). These anomalies could be the main factors which define the profitability of the quarry, the future mining planning and the environmental enhancement. As in the other quarries of the project, the used GPR exploration methodology used has consisted of performing GPR profiles with different frequency antennae, in order to achieve the maximum exploration depth into the quarry´s subsoil (up to 20 - 100 m). Examples of quarry platform (left) and not mined areas (right) explored. The quarry is located on a hillside, with great vertical development of the exploitation (in depth). The quarry, from the current area of exploitation to the roof, has a depth of approximately 30 meters. 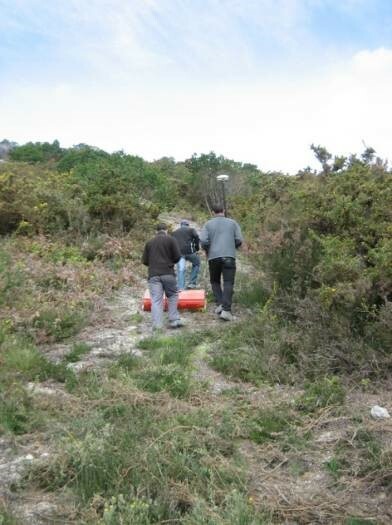 The ERT measurements into Penido Quarry were performed between the 28th and 31th of October 2013. The Penido quarry, geographically, is located into the NW of the Iberian Peninsula, in the south western of the Galicia region, immediately to the North of the Portuguese border. •	Decompression fractures: sub-horizontal, in "onion" layers. •	Tectonic fractures: sub-verticals / verticals. Fractures associated to decompression process are also common, there is an "arenisation granite", which has an influence in the shape of quarry. On the surface of the quarry area, the granite usually appears weathered. The main interest in this quarry is to know the tectonic shape (faults, fissures, etc.) of the quarry using ERT. These works are involved in the monitoring of non-destructive systems for the exploration of quarries. 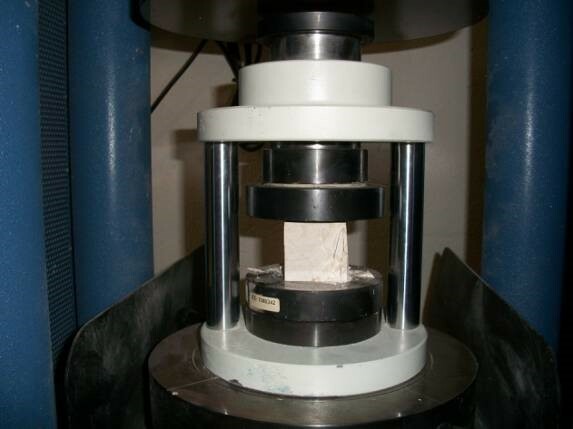 Specifically, the results of the measurements of the rock samples recovered in each one of the three natural stone quarries selected in the project are shown. •	Penido quarry in Carballeda de Avia (Spain). •	Hitusa quarry in Mugla (Turkey). •	Brescia quarry in Gavardo (Italy). •	EN 12407 Petrographic examination. •	EN 13161 Flexural strength. •	EN 1926 Compressive strength. •	EN 1936 Apparent density and open porosity. •	EN 12371 Frost resistance. •	EN 14146 Modulus of elasticity. The purpose of these data tests is to carry out, in correlation with the geophysical data and the analyses of them, a 3D characterization of the rock of the quarries. The results of this work will allow us to create numerical model, together with the compilation and correlation with other data, which will be the foundation for future phases of the project (geological modelling, geostatistical models, etc.) and moreover, it will be a useful tool for the definition of quality indexes for natural stone quarries. On La Verdad Spanish regional newspaper on 6.07.2014, it was published this new. 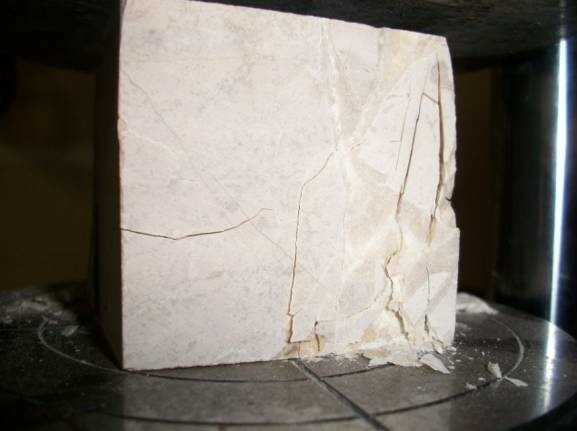 Marble Technology Center in the Murcia Region, through the Alliance for internalization Coniun - in which are also the centers of the Food and the Furniture and Wood - coordinates in their scientific aspect the European project Sustamining (Selective and Sustainable Exploitation of Ornamental Stones Based on Demand), aimed at "minimizing the environmental impact of mining and make sustainable this sector in Europe from an economic and environmental perspective." 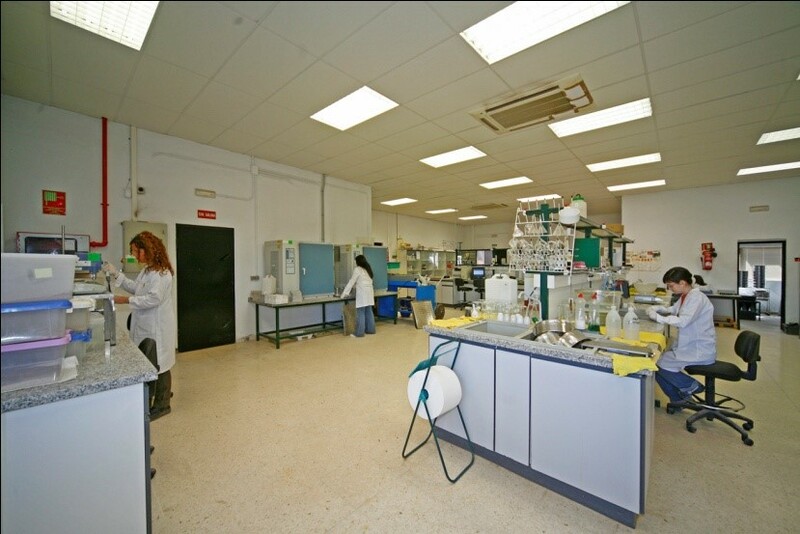 According to sources from the center, located in Cehegín, the research project, emerged from Murcia Center, has been selected by the European Union among the 15 best initiatives between the more than thousand presented in the framework program for R+ D+i to enhance the benefit of European SMEs. The initiative analyzes and investigates the application of “geophysical techniques to advanced knowledge of the subsoil and the subsequent extraction of mineral resources of natural stone", which translates into "a rationalization of resources and, therefore, less landscape impact by mining operations", according to said by the director, Javier Fernández. This week, the partners in this initiative have met in Cehegín to pool the first steps of the project, which has a budget of 2.5 million euros, which began in February and has a duration of three years. According to the director of the Technology Center, “they are generating knowledge and technology needed to radically improve the performance of the production of stone in terms of efficiency, productivity, quality, cost and environmental impact". Mr. Fernández added that "the natural stone industry is very important in Europe and is characterized by being traditional and mature, but is undergoing a transformation due to changing international economic landscape". In addition to the Technology Center, the project is participated the most important associations in the world of mining and ornamental stones in Europe. The idea is to improve efficiency, productivity, quality, cost and environmental impact of mining, a must after the European Union in 2008 warned that "the raw materials are essential for the competitiveness of the industry and to develop application of clean technologies". 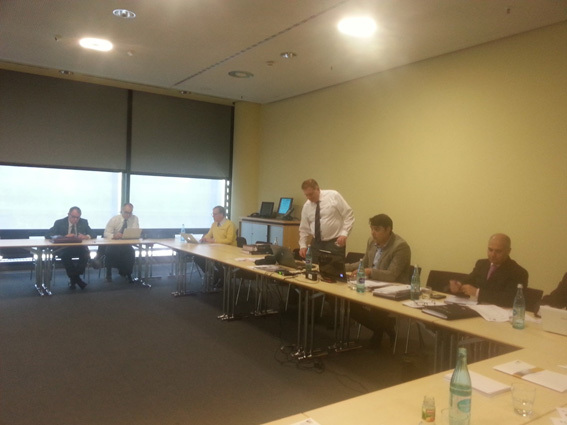 The project Kick-Off meeting took place in Wiesbaden (Germany), 7-8 February 2013 organized by DNV - project coordinator. 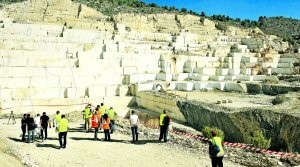 El Centro Tecnológico del Mármol de la Región, a través de la alianza por la internalización Coniun -en la que también están los centros de la Conserva y el Mueble y la Madera- coordina en su vertiente científica el proyecto europeo Sustamining (Selective and Sustainable Exploitation of Ornamental Stones Based on Demand), encaminado a «minimizar el impacto ambiental de la minería y hacer sostenible desde el punto de vista económico y medioambiental este sector de actividad en Europa». Según fuentes del centro, ubicado en Cehegín, el proyecto de investigación, surgido a iniciativa del centro murciano, ha sido seleccionado por la Unión Europea entre las 15 mejores iniciativas -de las más de mil presentadas- del programa marco de I+D+i para mejorar el beneficio de las pymes europeas. La iniciativa analiza e investiga la aplicación de «técnicas geofísicas para un conocimiento avanzado del subsuelo y la extracción posterior de los recursos mineros de piedra natural». Lo que se traduce en «una racionalización de los recursos y, por lo tanto, un menor impacto paisajístico por las labores mineras», según afirmó el director del centro, Javier Fernández. Esta semana, los socios de esta iniciativa de se han reunido en Cehegín para poner en común los primeros avances del proyecto -que tiene un presupuesto de 2,5 millones de euros-, que se inició en febrero y que tiene un periodo de duración de tres años. Según el responsable del centro tecnológico, «se están generando los conocimientos y la tecnología necesarios para una mejora radical del rendimiento de la cadena de producción de la piedra en términos de eficiencia, productividad, calidad, coste e impacto ambiental». Fernández añadió que «la industria de la piedra natural tiene mucha importancia en Europa y se caracteriza por ser tradicional y madura, pero está experimentando una transformación debido al cambiante panorama económico internacional». Además del centro tecnológico ceheginero, participan en el consorcio para el desarrollo del proyecto las más importantes asociaciones del mundo de la minería y de la roca ornamental en Europa. La idea es mejorar la eficiencia, productividad, calidad, coste e impacto ambiental de la actividad minera, casi una obligación después de que la Unión Europea advirtiera ya en 2008 de que «las materias primas son esenciales para la competitividad de la industria y para desarrollar aplicaciones de tecnologías limpias».